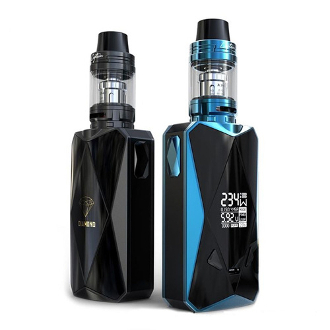 The Diamond PD270 Kit from iJoy is top rated in the vaping community. It is a powerful box mod kit that will deliver hours of satisfying vaping with delicious clouds of lush vapor. The Diamond PD270 Kit is fitted with a state of the art Captain X3S Tank. This tank holds 4.2ml of e-liquid and has a dual airflow ring found at the bottom. This allows for even more customization in flavor and vapor cloud production. It is a top fill tank that uses replaceable coil heads. Both features make for quick and easy maintenance. The mod box uses dual 20700 batteries (not included) and will deliver power up to 234W. It is fitted with a large OLED screen and the firmware is upgradable. There is full temperature control as well and utilizes Micro USB charging that also has a pass through feature. This means you are able to use your device while charging. For best performance, only use the charging cable provided and do not charge any other devices using the included charger. This will ensure no damage is done to either your battery or to other devices as well.